The Octatrack's front panel, which measures 34 x 18cm, provides hands‑on control of each and every function — no software editors here! What, in 2011, is the world really waiting for? Not a flying car or a robot housemaid nor even a portable jetpack, I suspect. In my world it's Ableton Live in a Box — or something similar. I've lost count of the number of times I've heard the same wish expressed by others who are seriously into live electronica but obstinately refuse to take a laptop on stage. If only, the thought goes, you could fluidly manipulate loops, samples and even complete song structures, resampling at will, all via a dedicated hardware box. A box with knobs and absolutely no capacity to receive email. 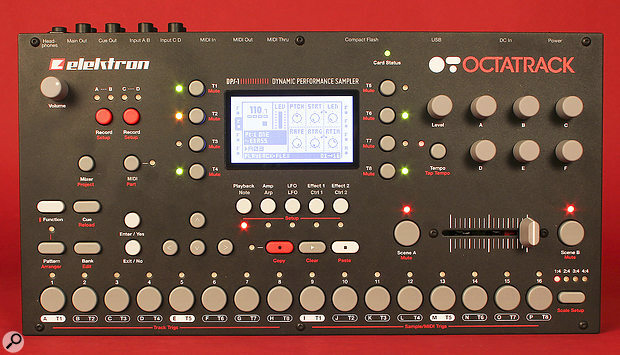 Then Elektron announced the Octatrack, promising much along those lines. I got excited and I waited. Then waited some more. When early units started shipping, it was on the understanding that the OS was still beta, the true unveiling tantalisingly in the future. But at last the future has arrived. It's time to climb aboard our robot housemaids, crack open a jetpack and take a ride on the Octatrack! Dealing quickly with the externals, the Octatrack is an unassuming black steel box of approximately 34 x 18 x 6cm and weighing a fraction under 2.5kg. Its black, red, grey and white colour scheme is both serious and businesslike, the brushed‑aluminium panel strewn with buttons, tri‑colour LEDs and rotary encoders. There's also a DJ‑style optical crossfader for those times when encoders and buttons won't cut it. Doing its best to present often large volumes of information is a small, backlit screen (resolution 128 x 64 pixels). With its rather blocky graphics and capitalised text, this is no computer display, and sometimes, when you're having a 'WTF?' moment, it feels rather inscrutable. The rear is pretty scrutable, though, with two pairs of audio inputs, two pairs of outputs (Main and Cue) and a headphone output. It's possibly a surprise that there's no digital I/O, but with a USB 2 port, 6V external power connection and three MIDI sockets, there is little else to raise an eyebrow — except, possibly, the Compact Flash slot, complete with a 4GB card to start your adventure. Oddly, the volume knob controls the headphone level, not that of the main outputs. A combination of the Function key and the track level encoder is the none‑too‑instant way of adjusting main volume. If Elektron would reverse this behaviour, or offer a user preference at least, I'd be grateful. Generally, there's little to disapprove of. The encoders are a bit close together, meaning that it's fingertips‑only operation most of the time, and the other point worth making concerns the lovely‑feeling optical slider. It sits in a groove that is an open window to the motherboard, and some kind of dust-protection sleeve would have been a comfort — to this flaky old hippy, at least. The Octatrack is an audio and MIDI pattern sequencer with eight tracks of each type. It's enough to mention for now that there are 256 patterns in total, divided into 16 banks (A‑P). A pattern contains triggers for internal audio and external MIDI events, plus information about the lengths of tracks and stored parameter values. When grappling with the Octatrack, it's easy to get overwhelmed, so I'll drip‑feed the usual technical details and hopefully spare you the conceptual difficulties I had at first, sitting with the manual in one hand and my aching head in the other. At the Octatrack's heart are its eight internal tracks — purveyors of stereo or mono audio. Each track hosts a software 'machine', of which there are currently four possible types: Static, Flex, Thru and Neighbor (sic). We've seen something similar in the sampling version of the Machinedrum, but here the concept is refined and extended almost beyond recognition. The first two machines are the most important, because they play back and manipulate samples — either streamed from the CF card (Static) or from a 64MB pool of RAM (Flex). The second two machines deal with processing external audio (Thru) or extending the effects chains of other tracks (Neighbor). Conscious that a hardware sequencer/sampler/looper with 64MB of RAM might not seem too exciting if reduced to its technical specs, I've opted for a more hands‑on tour to give an impression of the Octatrack in use. Therefore, rather than start with the supplied CF card, let's look at how to grab samples from a personal collection. Having connected the Octatrack to my computer via USB, it takes just a simple command and the Octatrack appears as an external drive. If you have a Windows machine, you'll quickly appreciate Explorer's ability to sort by bit rate and sample rate. Why is this relevant? Well, because the Octatrack prefers its samples to be 16‑bit, 44.1kHz, that's why. It will play back 24‑bit samples from Flex machines, but as there's only 64Mb of Flex RAM, and 24‑bit equals larger file sizes, it makes sense to stick to 16‑bit and have all samples available to both machine types. Mono or stereo wavs or aiff files are accepted, but 48kHz samples, for example, will play back at the wrong speed. There's no provision for handling other file types, such as Recycle (rex) files. Before starting to drag samples across, it's worth knowing something about the card's organisation. The highest-level structure is a Set, under which everything else sits. It contains a common audio pool that all projects share, and it's here that you place your sample library. The number of projects are limited only by card capacity and you'll probably have a number of them in each Set. The audio pool can be quite large, so is best organised into sub‑folders, with names chosen to identify content. Static and Flex machines each have 128 'slots' to populate with samples, and doing so can take a while. You can't simply fill multiple slots from a single folder; instead, you audition each sample, selecting as you see fit. Only 16-bit audio can be auditioned, making it an even better idea to convert everything beforehand. With a load of loops, hits, synth noises and even full tunes loaded, you're ready to go! All of the Octatrack's connections are found on its rear panel. From left to right, there's a socket for the 6V external power supply, a USB port for transferring files with a computer, the Compact Flash card slot, MIDI In, Out and Thru ports and (all on quarter‑inch jacks) four audio inputs, a pair of cue outputs, a pair of main outputs and a headphone port. True to its name, the Flex machine offers the most flexible audio manipulation. Its samples are in RAM, meaning that it's fast enough to perform several tricks that Static machines (themselves no slouches) can't. If you're worried that filling the RAM will leave you unable to sample later, you needn't — for reasons I'll come to in a moment. Supposing you've allocated a Flex machine to one of the eight tracks and picked a sample for it to play. Next, in order to hear anything, a trigger (or 'trig', in Elektron terminology) is required. Samples may be triggered manually with the 'Trig Keys' or you can hit the red record button and enter Grid Record mode, where each key represents a sequencer step — just like an x0x drum machine. If you require more than 16 steps, a 'Scale Setup' page (nothing to do with musical scales) can extend your pattern to a maximum of 64. Elektron have made some sequencing advances over their previous products with the Octatrack: tracks of different lengths are now supported. However, to quote Roy Walker: it's good but it's not right! Scale Setup offers a Master Length to which all tracks are periodically re-synchronised, a behaviour that disturbs any polyrhythms you might have running. Hopefully, a future update will allow an opt-out for this, so that each track can loop fully independently. Triggering long samples from a pattern‑based sequencer presents its own problems. One of Elektron's work‑arounds is that tracks can run at clock divisions as low as 1/8th standard speed. A 64-step pattern therefore requires a Master Length of 512 steps for a complete loop to occur. However, this creates its own difficulties, one of which is the time you have to wait for a pattern to end before a new one can start. Also, even the longest patterns might not last as long as your biggest samples. Fortunately, there's a less cerebrally challenging alternative that involves changing the 'trig type' to one‑shot. Do this and your sample is triggered once but not again — until manually re-armed. At this point, you might notice that some samples don't sound exactly right. This is because the Octatrack takes guesses about tempo on sample import, and those guesses aren't always 100 percent accurate. You could simply turn off the built‑in time‑stretching, but let's assume you have loops and stretching is important. A quick visit to the audio editor is what's needed. Considering the size of the display, sample editing comes off quite well. There's a zoomable representation of the waveform and various useful options: Trim, Slice, 'Attr' and 'Oper'. Attr is the one we'll take right now; its attributes include the time‑stretch type ('normal' or 'optimised for beats') and original tempo. If you know the tempo of your loop, entering it here should take care of any playback strangeness. We'll skip past the other edit options in order to see what else we can do with samples beyond triggering them. Common to all machines, the five buttons underneath the display each open a menu. With a Flex or Static track selected, pressing the first button, Playback, assigns encoders to the sample's pitch, rate, start point, length, retrigger time and retrigger speed. Pressing other buttons does the same for parameters of the Amp envelope, LFOs and the two effects present on every track. Sticking with Playback, you can tune the sample smoothly up or down by an octave. Turning its rate down slows the playback speed and optionally lowers the pitch — important for those 'tape slow' moments. Negative rates produce reversed playback. Retriggering is a great means of rapid‑fire sample repetition, and you can probably guess what varying the sample's start and length will do. However this is where Elektron's pattern sequencer's ability to store any parameter value transforms otherwise 'normal' functions. The process is known as parameter locks (aka 'p‑locks') and as an example of its use, locking offsets to a pattern's base pitch is a means of creating melodies. But that's just the start: p‑locks can be placed on any step, independently of machine triggering, meaning that even long‑playing samples can be manipulated over the length of a pattern. Admittedly, this isn't as easy as drawing over a waveform with a mouse, but it's not far behind. If, instead of storing p‑locks, you prefer to grab the encoders and record a performance, I heartily recommend 'Live Record'. It is engaged by holding Record and Play, from which point you can capture trigs and knob-twiddles freely. Via MIDI, you can play samples chromatically, with the proviso that all Octatrack samples have a range of just two octaves and are monophonic. There's an interesting extra function of the sample-start parameter when applied to sliced loops; that of selecting individual slices. Loops are sliced in the audio editor; they're divided into as many as 64 equal chunks (there's no transient‑based slicing) or manually by adding slice points. Here's where having neatly prepared loops pays dividends: providing you have the loop's tempo set accurately and it starts on a downbeat, there are some seriously cool tricks to be had. The most instantly showy is 'randomise locks', which mucks up the sequential order of slices in a pattern, often generating wondrous new loops, non‑destructively. The Octatrack's billing as 'Dynamic Performance Sampler' is well demonstrated when you start swapping slices around and tossing off instant remixes nonchalantly. If you like what you hear, copy the current pattern to a new location and try further variations. Which reminds me: copying patterns needs to be slicker. At the moment, you can only paste into the currently active pattern. In performance, even if you're lightning‑fast with your pastes, you won't be able to hit the first step of a new empty pattern before the Octatrack plays it! The second key machine is Static, its super power being the streaming of large samples. We're talking gigabytes long if necessary, direct from card. With Static machines, it's possible to compile a complete set of prepared songs and either play them totally straight as backing tracks, or manipulate them to the nth degree, adding loops from other tracks whenever inclined. Static samples can be sliced, time‑stretched, pitch‑shifted and modulated, but they do have some limitations compared to Flex machines. Fortunately, these aren't too serious: an LFO can't modulate a sample's start parameter and only complete slices can be looped, not parts of slices. Also, you can't perform some audio edits, such as normalise. However, the first time you throw a few songs, samples and completely unrelated loops together and it works, you appreciate the jamming potential of both machine types working together. You'll be pleased to know that every step of every track can trigger a different sample regardless of machine type — a process known as Sample Locks. Suddenly those eight tracks stretch quite a lot further! And for extra timing precision, I should quickly mention micro‑timing and swing, the former able to nudge each step forwards or backwards by 1/384 of a step — and more if you vary the clock resolution of the track. To bend your samples a little further, each track contains an Amp envelope, three LFOs and two effects blocks. These are accessed by pressing the relevant under‑screen buttons, with deeper 'setup' options available by double‑clicking or Function‑clicking (press Function key and desired button). At pattern level, you can override a sample's looping and time‑stretch behaviour — including whether the main Rate parameter should affect the sample's pitch. I found the time‑stretching quality to be completely useable within a few bpm, and even when pushed to extremes, the results were still 'interesting'. I particularly enjoyed slowing down loops from classical music CDs, relishing the artifacts produced by taking liberties with the tempo. Turning to the Amp setup menu, I was delighted to find an 'analogue envelope' mode in which the envelope restarts not from zero but from the envelope's previous level — it's so nice not to have to grovel for this feature! But the most modulation smiles appear on opening the LFO page with its three freely‑assignable LFOs. You specify their destination, waveform, playback behaviour and speed. For extra flexibility, the 'LFO designer' is a doorway to unique waveforms drawn using a combination of trig keys and encoders. Every stage of this waveform may be either stepped or smooth and the result is a tool that's amongst the most creative aspects of the Octatrack. LFO destinations include all standard track parameters, machine parameters, and the effects too. You can probably see why, with the right source material, the Octatrack can be a seriously powerful sound effects machine! The internal tracks have two effects blocks, each with filtering, EQ, chorus, phaser, flanger, compressor and a dirty lo‑fi selection. In the second block only, reverb and delay are added to the list. To create more complex effect chains — say, to have both reverb and delay at the same time — a Neighbor machine and a new track to host it are required. Positioned after the track you want to add more effects to, a Neighbor machine listens to the previous track (or tracks, if you have several Neighbors) and adds its own effects to the chain. Optionally, track eight can be designated 'master track' — and if so, its effects are placed across the entire output. The delay has a tape mode that interpolates smoothly between delay times during adjustment (with the crossfader, for example). With basic low‑ and high‑pass filtering included and an audio repeater mode, the delay should see lots of use. If I could have one wish granted, it would be that, instead of numbers, it dealt in musical clock divisions. Right now, you have to remember that 64 corresponds to a one‑beat delay (four 16th notes). The Gatebox Plate Reverb has a built‑in gating function and sounds a bit boxy — so good naming there! Its filtering, damping and decay-time parameters offer a decent selection of creative choices, though, and if used sparingly, it's not so bad. Generally, the effects are serviceable, if not spectacular, but they shine their brightest when modulated either by LFOs, p‑locks or dynamically by the crossfader. It's time to venture a little deeper. Each Octatrack Bank consists of 16 Patterns and four Parts. A Part contains a record of machines allocated to each track, plus their samples, effect assignments and all initial parameter values. So when I mentioned earlier that track eight could optionally be the master track, its effects placed over the entire output, this feels less wasteful for just one Part. In practical terms, it means that even in a single bank of 16 patterns you can completely replace the machine types, samples and audio routing of every track four times. And, remember, there are 16 banks in total. A Part also includes 16 Scenes. Scenes are linked to the optical crossfader/slider, their purpose to instantly pick from a set of prepared variations. Tracks are first tweaked to perfection by programming a series of parameter locks into Scenes A and B. The slider then smoothly morphs between these two sets of values. The sky's the limit for the jobs Scenes might do — anything from mixing seamlessly between prepared loops or tunes to reversing the playback of half the tracks whilst simultaneously spurting insane LFO modulation over the other half. Sampling on the Octatrack baffled me at first, and I only really got to grips with it after I put the manual aside and started tinkering by myself. At least comprehending the I/O didn't cause me any difficulties: the Octatrack can sample from any (or all) of the four audio inputs or from the Cue or Master outputs. You can sample manually or by having a 'record trig' kick it off for you, the latter a handy means of starting sampling bang on time. It's easy to import samples into the Octatrack via its USB port, and in Windows you can sort your samples by sample rate and bit depth. Instead of offering a free pool of sampling RAM to divide up as you see fit, every track has a fixed allocation of 2.7MB. This is totally separate to the 64MB used by Flex machines, and if you want to pre‑set the recording time in sequencer steps, the maximum allowed is just 64. Otherwise, the limit of a single recording is about 16 seconds. The vital starting point for sampling is the Recording Setup menu. If using a record trig, you must remember to hold down the record trig key and verify that the source is correct. This is because tracks can initiate sampling from any sequencer step and each step can record from any possible source. Talk about mind‑boggling! In order to avoid overwriting the same sample repeatedly, the record trigs must be set as 'one‑shot'. Until re-armed, the track will now only record once. Supposing you've managed that and captured a sample. After a celebratory sweet sherry, you'll find that playing back your sample isn't so straightforward. It requires a play trig for the track recorder you just used, either on the same track or on another. While this is all very flexible, it is also never trivial, and I confess I did occasionally pine for a basic looper. There's no recording direct to card (yet? ), and since your recordings are lost on power‑off, you'll need to save any that are worth keeping. To do this, we'll nip smartly back to the audio editor and use its 'save and auto assign' function. This saves your sample to the CF card and assigns it to the originating track for playback. The four audio inputs aren't reserved for sampling, and can be used in a variety of ways, such as mixing up to four separate mono sources. Using Thru machines, you can create tracks that link unique effects with each input, and with small rigs this could even save you carrying a mixer. At a push of a button, tracks can be redirected to the Cue outputs. This is ideal when cueing loops in headphones ready to drop in, but is equally good when farming out Octatrack samples for external processing. By routing the processed signal back via one of the input pairs, you gain a no‑nonsense way of incorporating favourite effects such as lush reverb or analogue filtering. I recall grinning like a loved‑up hyena the first time I tried this. Some mixing operations are less elegant, though. Soloing a track, for example, is achieved by first entering the mixer page then using a combination of the Cue button and a trig key corresponding to the track. The mixer page gathers the muting of all audio and MIDI tracks into one place, which is convenient, but a quicker way to mute is by using the Function and track keys. Irrespective of the method, all mute processing also chops off any effect tails, which can sound rather abrupt. Patterns can store a great deal of useful information, but they don't store track mutes or tempo — vital components of a live set. In Elektron's universe there are usually work‑arounds and for the former, you can store an amplitude of zero for tracks you don't want to hear. There's a built‑in solution that's a bit better, though: the Arranger. Its purpose is to string patterns together and generally take the hard work out of assembling a song. Arrangements can have up to 256 rows, each pointing to a pattern with individual repeats, length, tempo, transpose of MIDI tracks and even remarks to remind you what on earth is happening. You can loop sections of the arrangement, store mute overrides for each pattern and define the Scenes that should be active when a pattern plays. There are just eight named Arrangements per Project, which doesn't feel like enough, plus the whole thing is squeezed into a small corner of the display making it less than a joy to use. I quickly realised that, because of its power, the Octatrack wasn't as straightforward as I'd hoped. Possibly I've pointed out more areas ripe for improvement than I ordinarily would, but this is because I genuinely like the Octatrack! It has a feature set in hardware that I've been waiting years for — and given Elektron's track record of updating gear long into its life, I'm still hoping to update that 'like' to 'love'. Let's be clear: the Octatrack is not actually Ableton Live in a box — nor does it claim to be. It is, however, a viable one‑stop alternative, performing many comparable functions but in its own unique way. That way is shaped by its sequencer and by good, old‑fashioned 'hands‑on'. Ultimately, the Octatrack will be defined by what it can do, not by what it can't. Today it offers a well‑matched set of tools for sampling and resampling, for combining samples — even tune‑length ones — and bending them into crazy new shapes. Whether for live or studio applications, this self‑contained chunk of hardware can take you places a mouse and monitor won't. And it has absolutely no capacity to receive email. Compared to a laptop‑based system including controller, software and audio interface, the Octatrack's dedicated hardware and software doesn't seem so expensive. In pure hardware terms, there's not much that compares, though the Akai MPC range probably come closest. The larger and pricier MPC5000 can serve as a multitrack recorder, virtual synth, high-resolution sequencer and 64‑note polyphonic sampler. However, the MPC workflow and handling is quite different, their appeal different also. Given that Compact Flash first appeared in the mid‑1990s, it's surprising to find it still going strong. Presumably this is due to its reliability — I know I've used the same card in my Electrix Repeater for years and, touch wood, it's performed without a hitch. The supplied 4GB card (133x speed) is around half full of content from Loopmasters — and some spiffing loops there are too. There isn't space to enthuse at length, but with both quality and quantity taken care of, this is a potentially useful gift. The eight MIDI tracks are not simply add‑ons; they're fully functional in their own right. This MIDI step sequencer increases in power by mirroring some functions of an internal track: for example, it has LFOs capable of generating continuous controllers. Each step can trigger chords of up to four notes, and there's even a built‑in arpeggiator. In Live Record mode, you can play notes via an external MIDI keyboard and record incoming CC info. As a simple step‑time MIDI looper, this works splendidly! The Octatrack's MIDI spec isn't too shabby either. Internal tracks can be remotely controlled, muted, soloed, and so on, and the Octatrack is equally happy to be master clock in your system, or a slave. The biggest limitation I found was the inability to select patterns via MIDI. This must be done manually from the Octatrack itself. ... as well as an audio processor and MIDI sequencer. Some operations are a bit clunky. The effects are a bit conservative. A fresh slant on sampling, the Octatrack places its emphasis on sequenced audio twisting but can assume a surprising number of other identities, thanks to its versatile, if slightly mind‑bending, nature. Elektron +46 (0)31 743 7440.